Leopard costume: a leopard print dress (or skirt and top combo), black ears (easy to DIY if needed! ), black heels, red lipstick, a black clutch and leopard-print accessories. 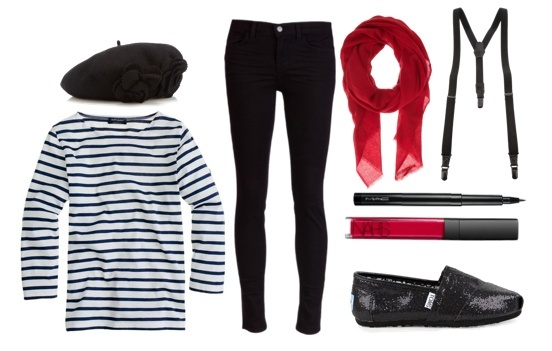 Mime costume: a beret, a striped top, black pants, a red scarf, suspenders, black eye liner (for mime makeup), red lip gloss and black flats. Ring leader costume: a blazer, a top hat, a sparkly top, a black skirt, a whip, black knee socks and knee boots, red lip gloss and a sparkly clutch. Check out my Pinterest page for more costume ideas and head to Polyvore for outfit details.